BALTIMORE (December 1, 2015) — Planit is proud to announce its partnership with Mr. Roof, the nation’s largest residential roofing company. For 50 years, Mr. Roof has been committed to providing the best quality roof for the most competitive price with offices in Nashville, Louisville, Cincinnati, Grand Rapids and Ann Arbor. Mr. Roof also operates as Able Roof in Columbus, Ohio. Planit was tasked with creating a new brand identity and implementing a comprehensive marketing strategy for Mr. Roof as it looks to reach new customers and enter new markets. 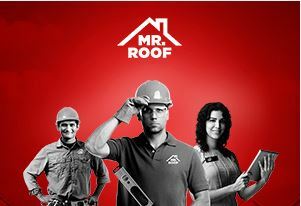 To date, the agency has transformed the company’s logo, redesigned its website and created a campaign around the “Roof Crew” that demonstrates the multiple people behind the scenes — from installers to customer service representatives — who are essential to the Mr. Roof customer experience. This campaign includes television, print and digital advertising. Planit has also designed a new trade show booth, developed a direct mail campaign, created a homeowner education video and developed other marketing collateral for the company. BALTIMORE (October 9, 2015) — On the heels of jumping more than 1,000 spots on the 2015 Inc. 5000, Planit was selected by The Initiative for a Competitive Inner City (ICIC) and FORTUNE for the 2015 Inner City 100, a list of the fastest-growing inner city businesses in the U.S.
Planit ranked 42nd overall on the list of 100, up 38 positions from 2014. 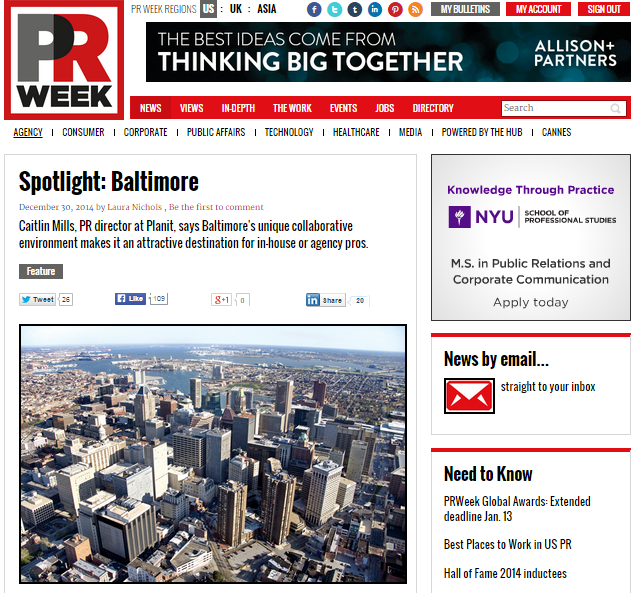 The Baltimore-based integrated marketing firm reported a five-year growth rate of 228 percent from 2010-2014. ICIC’s Inner City 100 program recognizes successful inner city businesses and their CEOs as role models for entrepreneurship, innovative business practices and job creation in America’s urban communities. Each year ICIC works with a national network of nominating partners to identify, rank and spotlight rapidly growing urban businesses, and the top 100 — determined by revenue growth — are honored on the Inner City 100 list published in FORTUNE. The full list can be viewed on the FORTUNE website here. The rankings were announced at the Inner City 100 Conference and Awards on Wednesday, October 7, 2015, at the John F. Kennedy Presidential Library and Museum in Boston, Massachusetts. Before the Awards celebration, winners gathered for a full-day business symposium featuring management case studies from Harvard Business School professors and interactive sessions with top CEOs. Keynote speakers included Governor Charlie Baker, Harvard Business School Professor and ICIC Founder and Chairman Michael E. Porter, University of Massachusetts Boston Chancellor J. Keith Motley, Boston Beer Chairman and Co-Founder Jim Koch, Hill Holliday CEO Karen Kaplan and Uber East Coast General Manager Meghan Verena Joyce. The Inner City 100 list provides unmatched insight into the impact entrepreneurship can have on underserved communities. In the last 17 years, over 800 unique companies have earned positions on the Inner City 100 list, and alumni include Pandora, JP Licks and Angie’s List. Chevron Corporation and Staples, Inc. are long-time sponsors of ICIC and the program. Boasting an average five-year growth rate of 378 percent between 2010 and 2014, the 2015 Inner City 100 winners represent a wide span of geography, hailing from 45 cities and 23 states. Collectively, the winners employ 6,168 people, and nearly one-third of their employees live in the same neighborhood as the company, on average. Inner City 100 Methodology: The Initiative for a Competitive Inner City (ICIC) defines inner cities as core urban areas with higher unemployment and poverty rates and lower median incomes than their surrounding metropolitan statistical areas. Every year, ICIC identifies, ranks and spotlights the 100 fastest-growing businesses located in America’s inner cities. In 2015, companies were ranked by revenue growth over the five-year period between 2010 and 2014. This list was audited by the independent accounting firm Rucci, Bardaro, & Falzone, PC. 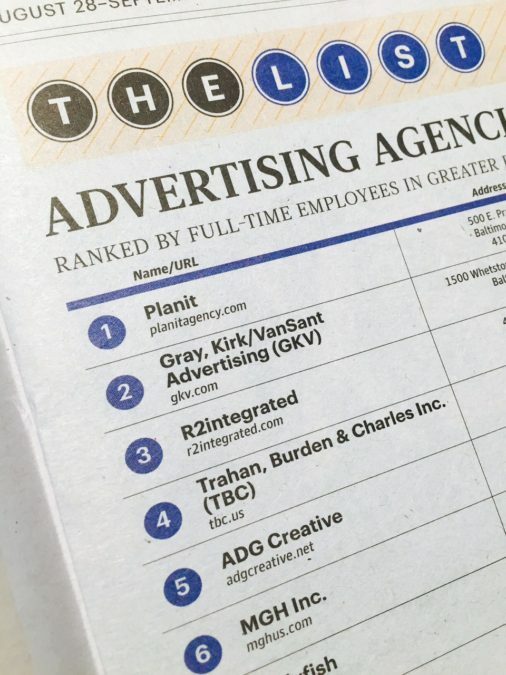 Baltimore Business Journal’s Top Advertising Agencies List is something our founders, Matt Doud and Ed Callahan, and our dedicated Planiteers work toward each year. We’re especially proud this year to see Planit at number one – and we’re just barely hitting our stride. BALTIMORE (August 14, 2015) — Planit, Baltimore’s top award-winning communications, marketing and interactive agency,is pleased to announce that it has secured a spot on the 2015 Inc. 5000. This year marks the 34th year Inc. magazine has put out a list of the fastest-growing private companies in the United States. Planit now holds the position of 2,091 on the esteemed list, up 1,054 spots from the previous year. The Inc. 5000 is the most comprehensive recognition of the most important segment of the economy — America’s independent entrepreneurs. The list is ranked according to percentage revenue growth when comparing 2011 to 2014. To qualify, companies must have been founded and generating revenue by March 31, 2011. They had to be U.S. based, privately held, for profit and independent — not subsidiaries or divisions of other companies — as of December 31, 2014. Planit, holding a position of 2,091 on the Inc. 5000, joins the ranks of powerhouses on the 2015 list such as Fitbit, Smashburger, Giftcards.com and Planet Fitness. Complete results of the Inc. 500/5000, including company profiles and an interactive database that can be sorted by industry, region and other criteria, can be found at www.inc.com/5000. The annual Inc. 5000 event honoring all the companies on the list will be held October 21 to October 23, 2015, in Orlando. Speakers include some of the greatest entrepreneurs of this and past generations, such as Marcus Lemonis, host of the CNBC show “The Profit”; Robert Herjavec, one of the main “sharks” on ABC-TV’s “Shark Tank”; KIND Founder and CEO Daniel Lubetzky; and Co-Founder of Goodshop.com JJ Ramberg. BALTIMORE (August 5, 2015) — Today Planit is excited to announce its partnership with The Association of Pool & Spa Professionals (APSP), a national organization representing the entire swimming pool, spa and hot tub supply chain. The mission of APSP is to provide awareness, education, safety standards, codes and certification information to the community and support the growth and development of its members’ businesses. As agency of record, Planit will raise consumer awareness about the benefits of pools, hot tubs and spas through a new integrated marketing campaign called Escape. The campaign spans across a variety of channels including print advertisements, a microsite, experiential trade show marketing and PR and digital media support. In addition to garnering consumer awareness, the effort also unites manufacturers and dealers behind the common goal of promoting the industry on a national scale. Escape will entice potential pool and spa owners to transform their backyards into their own staycation havens. The creative, which will display a wide range of images such as tropical paradises confined within backyard pools and spas, will be published nationally across print and digital channels throughout 2015 and 2016. The campaign will launch at the International Pool | Spa | Patio Expo in Las Vegas, November 10–12, 2015. The Association of Pool & Spa Professionals (APSP) is the world’s oldest and largest association representing swimming pool, hot tub and spa manufacturers, distributors, manufacturers’ agents, designers, builders, installers, suppliers, retailers and service professionals. Dedicated to the growth and development of its members’ businesses and to promoting the enjoyment and safety of pools and spas, APSP offers a range of services, from professional development to advancing key legislation and regulation at the federal and local levels, to consumer outreach and public safety. APSP is the only industry organization recognized by the American National Standards Institute to develop and promote national standards for pools, hot tubs and spas. For more information, visit APSP.org. Connect with APSP on Twitter, Facebook and YouTube. BALTIMORE (August 3, 2015) — Planit, Baltimore’s top award-winning communications, marketing and interactive agency, today announces plans to move into a new office space in the burgeoning Key Highway business district. Co-founders Matt Doud and Ed Callahan signed a lease for a nearly 30,000-square-foot office located at 1414 Key Highway. The agency plans to renovate the historic space, originally the Syrup KING Molasses building built in 1919, with a custom design in time for an April 2016 move. Planit has always called downtown Baltimore home. The agency has inhabited its current office at 500 E. Pratt St. since 2005, when the agency moved from the Power Plant Building on Pratt Street. Callahan and Doud spent several months evaluating options for the agency’s office expansion, including remaining in its current location, before choosing the Goodier Property Group opportunity at 1414 Key Hwy, an off-market property presented by Joe Bradley, vice president of MacKenzie Commercial. The agency has partnered with Southway Builders and Gensler & Associates to design a space that conveys Planit’s vibrant energy and creative personality and that provides a customized, innovative work environment for its 100 employees. The building will include space for future expansion, as the company expects double-digit growth in 2016 and beyond. It will be a total contrast from what Planit has occupied in the past—a distinct differentiator being a retail component that will be announced in the near future. The agency plans to invest approximately $5 million in the project. Today Planit is proud to announce its partnership with Susan G. Komen® Maryland, a local affiliate of the world’s largest breast cancer organization, which funds more breast cancer research than any other nonprofit while providing real-time help to those facing the disease. Planit will reinvigorate the affiliate’s iconic Race for the Cure event to be held on October, 25 2015, in Hunt Valley, Maryland, the largest charitable footrace and one of the top five fundraisers in the state, through a comprehensive marketing campaign designed to communicate its #onestepcloser call to action. The multifaceted campaign will refresh the Race’s theme, collateral, TV and radio spots, digital ads and website assets while providing strategic public relations and social media support to communicate race details to local media and participants on a traditional and digital level. Registration is now open for the 23rd Annual Komen Maryland Race for the Cure in Hunt Valley, Maryland, at Shawan and McCormick Roads. Visit http://www.komenmd.org/2015 to register. For more information, call 410-938-8990 or visit www.komenmd.org. 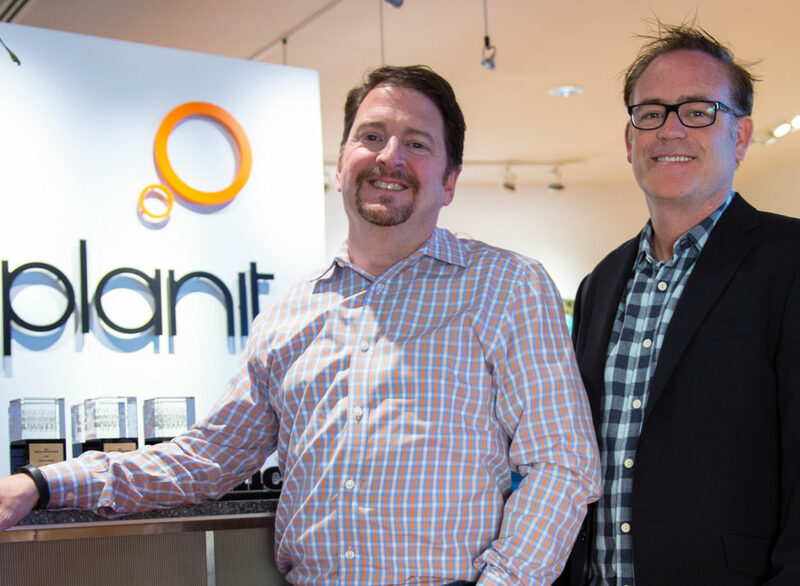 BALTIMORE (June 26, 2015) — Planit, Baltimore’s top communications, marketing and interactive agency, today announces that co-founders Matt Doud and Ed Callahan have been selected as winners of the prestigious EY Entrepreneur Of The Year® award in the Maryland region. The awards program recognizes entrepreneurs who demonstrate excellence and extraordinary success in such areas as innovation, financial performance and personal commitment to their business and communities. Doud and Callahan founded Planit in 1994 with the goal of creating a different kind of ad agency—a place focused on transformative ideas. They envisioned Planit as a partner to clients, on the front lines of solving business problems. Today, Planit provides revolutionary creative solutions to a broad range of global, national and regional clients. The EY Entrepreneur Of The Year finalists were selected by a panel of independent judges. Award winners were announced at a gala on June 25 at the Baltimore Marriott Waterfront hotel. Regional award winners are eligible for consideration for the EY Entrepreneur Of The Year national program. Award winners in several national categories, as well as the EY Entrepreneur Of The Year National award winners, will be announced at the annual awards gala in Palm Springs, California on November 14, 2015. The US Entrepreneur Of The Year Overall award winner then moves on to compete for the World Entrepreneur Of The Year award in Monaco in June 2016. EY Entrepreneur Of The Year is the world’s most prestigious business award for entrepreneurs. The program makes a difference through the way it encourages entrepreneurial activity among those with potential and recognizes the contribution of people who inspire others with their vision, leadership and achievement. As the first and only truly global awards program of its kind, Entrepreneur Of The Year celebrates those who are building and leading successful, growing and dynamic businesses, recognizing them through regional, national and global awards programs in more than 145 cities in more than 60 countries. For more information, visit ey.com/eoy. 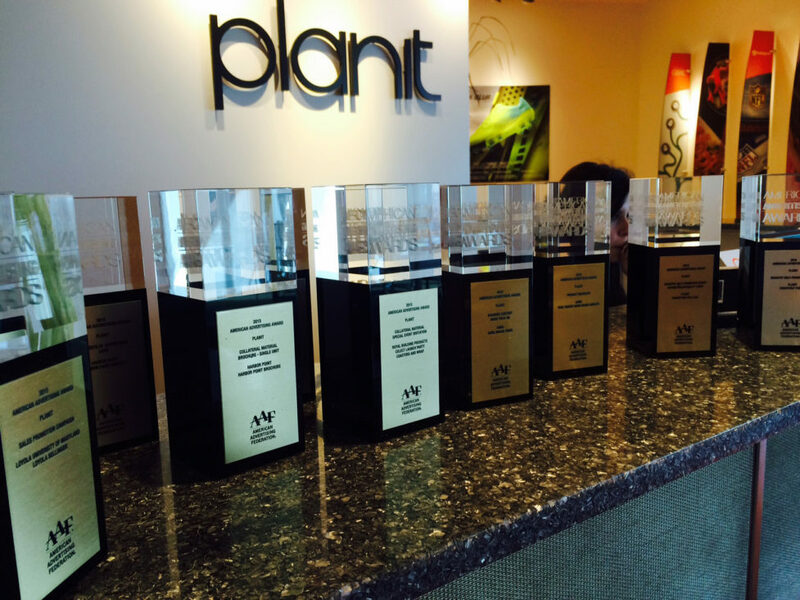 Planit is proud to announce we have been honored with a Best of NAMA award from The National Agri-Marketing Association for our work on the AGCO Biomass Solutions blog. The Best of NAMA awards program honors industry-leading work in agricultural communications. The Biomass Solutions team at AGCO tapped Planit to help the brand grow awareness of AGCO’s Biomass Solutions, to elevate its position as a leader in the biofuel industry, and to engage with more potential customers through shareable content. Planit developed an infographic-style content page to educate and inform AGCO’s fans, employees, investors, and the agriculture industry on the importance of biomass and how AGCO is leading the way. By highlighting interesting statistics and factoids throughout the blog, we were able further engage the reader and show thought leadership. Planit developed a strategic communications strategy to drive visitors to the biomass blog including eye-grabbing graphics, custom content for individual social media channels, engagement with AGCO followers, influencer outreach, guest bloggers, and more. REACH: Planit was able to generate massive awareness on Facebook—posts were seen by over 332,000 users organically and over 939,000 users via Facebook Ads. ENGAGEMENT: Organically, the campaign netted a 15 percent engagement rate on Facebook. Moreover, content resonated across all social media channels—the blog received 774 clicks from Twitter, biomass-related photos received over 100 likes on Instagram, and the biomass video was seen by over 1,200 people with more than 1,600 minutes watched on YouTube. TRAFFIC: Over 3,000 visits were driven to the biomass blog, a 41 percent increase in blog visits compared to pre-launch traffic. More importantly, users were interested in the content of the blog, spending an average of three minutes on the site. BUSINESS LEADS: By encouraging blog visitors to inquire with the Biomass Solutions team, AGCO received profitable and trackable business leads. Planit, a Baltimore-based communications, marketing and interactive agency, today announces that co-founders Matt Doud and Ed Callahan are finalists for the prestigious EY Entrepreneur Of The Year® award in the Maryland region. The awards program recognizes entrepreneurs who demonstrate excellence and extraordinary success in such areas as innovation, financial performance and personal commitment to their business and communities. Doud and Callahan founded Planit in 1994 with a goal of creating a different kind of ad agency—a place where ideas were central. They envisioned Planit as a partner to clients, on the front lines of solving business problems. Today, Planit provides creative solutions to a broad range of global, national and regional clients. The EY Entrepreneur Of The Year finalists were selected by a panel of independent judges. Award winners will be announced at a special gala on June 25 at the Baltimore Marriott Waterfront hotel. 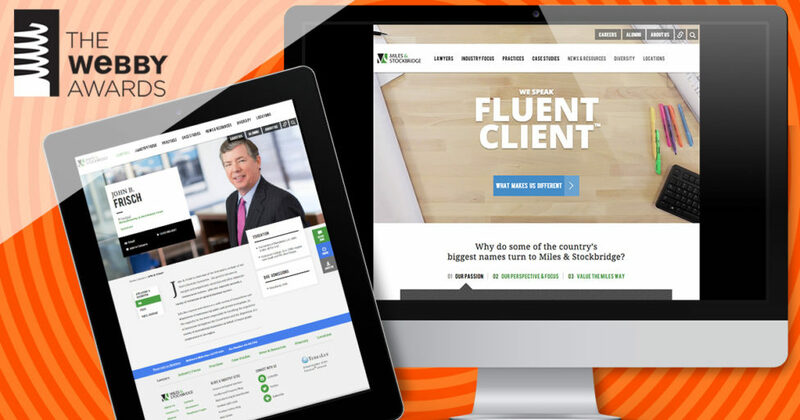 Planit, a Baltimore-based communications, marketing and interactive agency, announced today that it has been named an honoree for Best Law Website for its work for Miles & Stockbridge in the 19th Annual Webby Awards. Hailed as the “Internet’s highest honor” by The New York Times, The Webby Awards, presented by the International Academy of Digital Arts and Sciences (IADAS), is the leading international award honoring excellence on the Internet. IADAS nominates and selects The Webby Award winners, and its members include web industry experts such as Tumblr’s founder, David Karp; Grantland’s Bill Simmons; Lucky magazine’s editor-in-chief, Eva Chen; Instagram’s co-founder, Kevin Systrom; Martin Cooper, inventor of the mobile phone; and creator of the GIF file format, Steve Wilhite. Planit was tasked with transforming the Miles & Stockbridge website in a way that would showcase the law firm’s industry focus, shine a spotlight on its core competencies and introduce potential clients to each individual lawyer in the practice. The agency, known for fostering bold ideas through its philosophy of respectful disruption, saw an opportunity to go beyond the task and, with the user top of mind, take the project a step further by making the site experience intuitive, memorable and pleasantly unexpected. Hailed as the “Internet’s highest honor” by The New York Times, The Webby Awards is the leading international award honoring excellence on the Internet, including Websites, Advertising & Media, Online Film & Video, Mobile Sites & Apps and Social. Established in 1996, The Webby Awards received nearly 13,000 entries from all 50 states and over 60 countries worldwide this year. The Webby Awards is presented by the International Academy of Digital Arts and Sciences (IADAS). Sponsors and Partners of The Webby Awards include: Grey Goose, Vitamin T, Shocase, Engine Yard, Funny or Die, Advertising Age, Percolate, Mashable, Business Insider, Internet Week New York and Guardian News and Media. A website for a Grammy award–winning band, a brand video for a manufacturer of American-made lawn and garden tools, and packaging for a national salad dressing company—what do these all have in common? They were all honored with American Advertising Awards at last night’s “Downton ADDY”–themed event hosted by the American Advertising Federation of Baltimore. And they were all created by Planit. The annual awards competition, formerly the ADDY® Awards, celebrates Baltimore’s most talented marketing communications professionals. Highlights of the 14 gold and silver awards won by Planit include websites for musicians Weezer and Neon Trees as well as the AMES® True Temper® snow brush, a brand video for AMES, packaging for Tessemae’s All Natural, launch event materials for Celect® Cellular Exteriors by Royal®, a campaign for Loyola University of Maryland Sellinger School of Business, a brochure for Harbor Point and Planit-branded Disruption Pale Ale. This year the American Advertising Federation of Baltimore received more than 240 entries from agencies, production houses and in-house marketing teams in the Baltimore area. To ensure fair judging, four creative advertising professionals from outside of the Baltimore market reviewed each entry. The 41st Annual Baltimore American Advertising Awards event was held at the Sheraton Baltimore North Hotel on Thursday, March 12. This year’s theme was inspired by the popular British television show “Downton Abbey.” For more information on the American Advertising Federation of Baltimore and a complete list of last night’s winners, visit www.baltimoreadvertising.com. Planit has been chosen to help local real estate revolutionaries transform the process of renting office space. Kinglet, an online marketplace for office space, curates appealing spaces and makes them available to emerging companies. Pricing is all-inclusive with flexible terms allowing businesses to grow in place — or nest. As Kinglet’s agency partner, Planit will build awareness and buzz around Kinglet as well as enhance the design and usability of Kinglet’s online platform. Kinglet currently has rentable office spaces spanning the Baltimore metropolitan area, including a recently launched collaboration with Maryland Nonprofits and real estate powerhouse Corporate Office Properties Trust (COPT). Collaborative consumption efforts have grown exponentially in the past few years the peer-to-peer sharing of business resources. With Planit, Kinglet’s platform is poised to launch commercial real estate into the sharing economy of 2015, breaking down traditional barriers to flexible office space. Kinglet is a digital marketplace connecting emerging companies with flexible and affordable office space. Kinglet helps businesses stay nimble and thrive by providing monthly terms, all-inclusive pricing, collaborative environments and standard agreements while also helping companies with unused office space maximize revenue. Kinglet’s technology allows businesses to locate and secure new office space in as little as 24 hours. Planit, a Baltimore-based communications, marketing and interactive agency, today announces the promotion of Hector Gonzalez to director of account management. In his new role, Gonzalez will oversee more than 25 account managers for the agency’s growing client roster including national and global brands such as AGCO, DEWALT, Royal® Building Products, Universal Music Group, Mally Beauty, Marriott International and more. Gonzalez spent the past two years as the director of account planning at Planit, where he was instrumental in developing strategic integrated campaigns and overseeing reporting and metrics for each initiative, such as DEWALT’s Tools of the Brave campaign. Throughout Gonzalez’s award-winning career, he has developed and supported several noteworthy campaigns including the U.S. Department of Homeland Security’s “If you see Something, Say Something” initiative. Prior to joining Planit, Gonzalez served as a founding partner and vice president of client services at DWG Design in Baton Rouge, Louisiana, as well as account director at LMD in Laurel, Maryland. A native of Venezuela, Gonzalez spent the majority of his early career in Louisiana where he served as the youngest president of the Baton Rouge American Advertising Federation (AAF). Gonzalez graduated from Louisiana State University with a B.A. in mass communications and advertising and received his MBA at Loyola University Maryland. Forget the excess baggage from 2014—the dizzying lists of epic social media wins and fails, headline-grabbing campaigns, and the most shared and tweeted posts of the year. 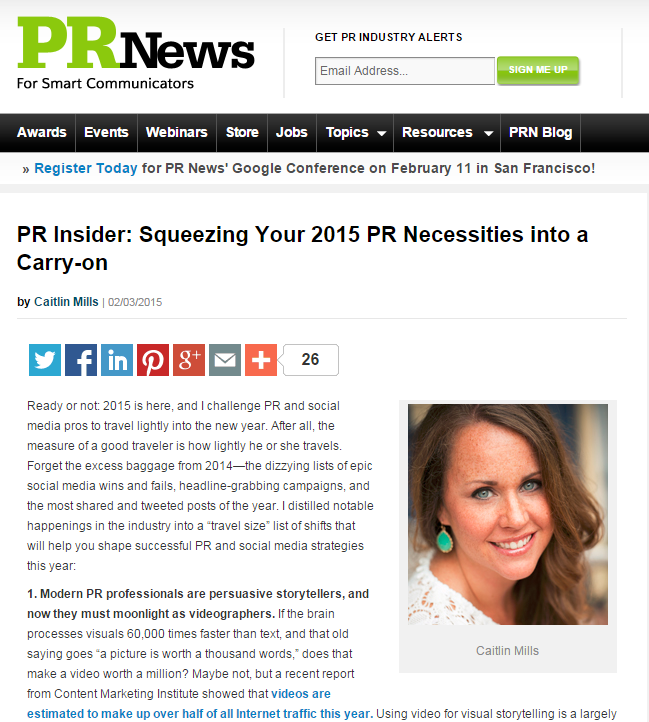 Planit’s director of PR and social media, Caitlin Mills, has compiled six notable industry shifts that you need to know for 2015. Check it out here.